Meet Mile End Kicks. Member of the Mile-End Business Association. 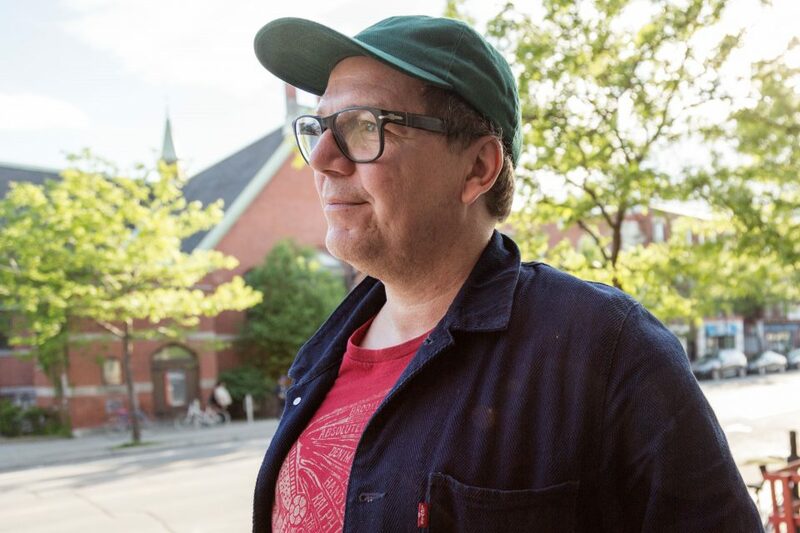 Introducing Sam Papoutsis, Mile-End’s original dealer of fresh kicks. Let’s time travel. Bring us back to what led to you to Mile End Kicks. Alright, let’s go back to the start. In 2009 I found myself unemployed and spending a lot of time at the coffee shop on St-Viateur, Club Social. I saw a storefront on Parc Avenue that was vacant and I was just curious. I didn’t even know if it was a good location at the time but the rent was good. I said, you know what, I’ve got some time off from the corporate world so maybe I should check it out. Before this time I worked in footwear and that’s all my brain knew. So I said, let’s see if we can get some sneakers on shelves. Hanging with my buddies at Club Social, we talked about the idea and one guy says, “Yeah Sam! You should do it man! Go for it!” and he wasn’t high, he was straight as an arrow. I got a lot of encouragement from buddies to start the shop. It’s important. We opened with three shelves on each side of the shop, filled them with footwear, and we were very customer-centric. The whole store is made of wood, and that was my concept, to bring back the 80s look. My dad helped me build the place from scratch. It was really fun and kind of like a hang at the beginning and word got out. I had a friend who helped me at the beginning, we were only two to begin with, and it kept growing. We started with basic needs, just regular Converse and Keds, and we had some adidas, New Balance and Saucony and we went from there. Back in 2009 there was nothing around here. There was a record shop next to me early on, Phonopolis, this is where they opened but they moved. I think it helped us early on because local musicians would flip through records and then come through the shop. Over the years I’ve had great local artists and musicians work in the shop. They might be famous today, I don’t know. 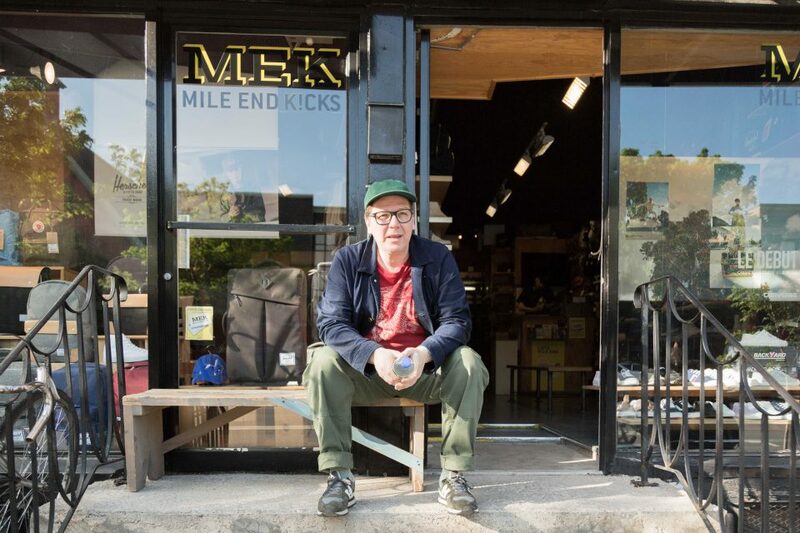 I didn’t think Mile End Kicks was going to become a legitimate business but it’s a great success and it’s all due to the great people in this neighbourhood and the customers who’ve been here since the beginning. What’s the vibe of the shop in your words? How do you choose product? The whole concept behind Mile End Kicks was a feeling of retro, heritage sneakers. How it started in my head was because I was starting to appreciate all of these heritage brands back when I was a kid growing up and realized how little choice there was. We’ve stayed mostly retro and true to our roots. We try to bring in new and different brands every season and love bringing in fresh product. Backyard and Victoria, for example. Nobody carries this stuff. It’s made in Europe. But we try to bring in locally-made brands too and we’re always open to looking at new things. Down the street we have the second location with different footwear, more boots and sandals and nice bags and hats too. We give women and men and teenagers an opportunity to find something they won’t find in a regular old mall. Cause all you see is the same sh*t all the time. And it’s the Mile-End, it’s not like any other neighbourhood in Montréal. We go in our own direction. You’ve definitely got a personal style and swag going on. Ha! I like to stay young in my mind. This keeps me young. 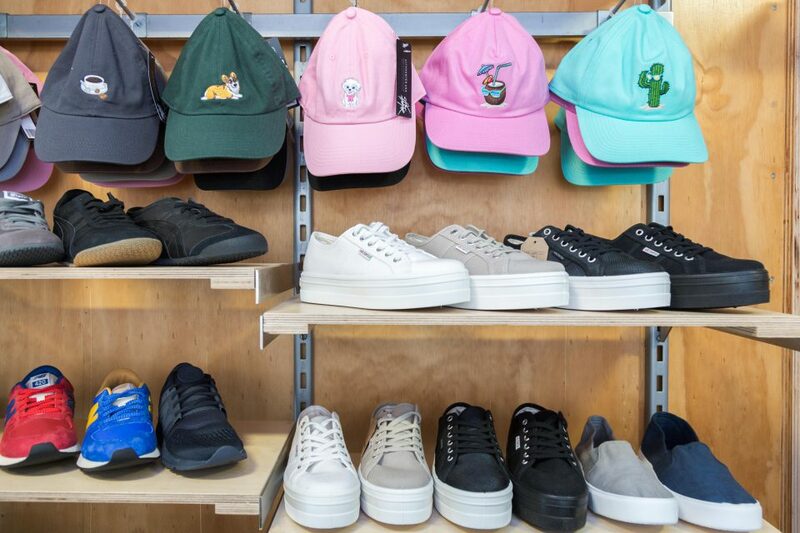 What are a few of your favourite kicks in the shop and some stories behind them? Sure! 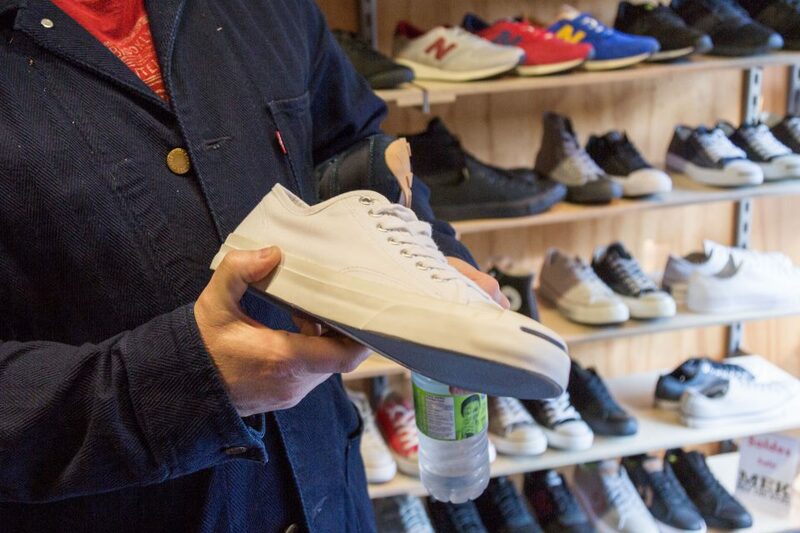 This here is a famous Converse shoe called the Converse Jack Purcell. Jack Purcell was an old badminton champ here in Canada. In the early years of the brand he showed Converse how to pick up the tennis and badminton feel. It’s a simple white shoe and I love how simple and comfortable it is. 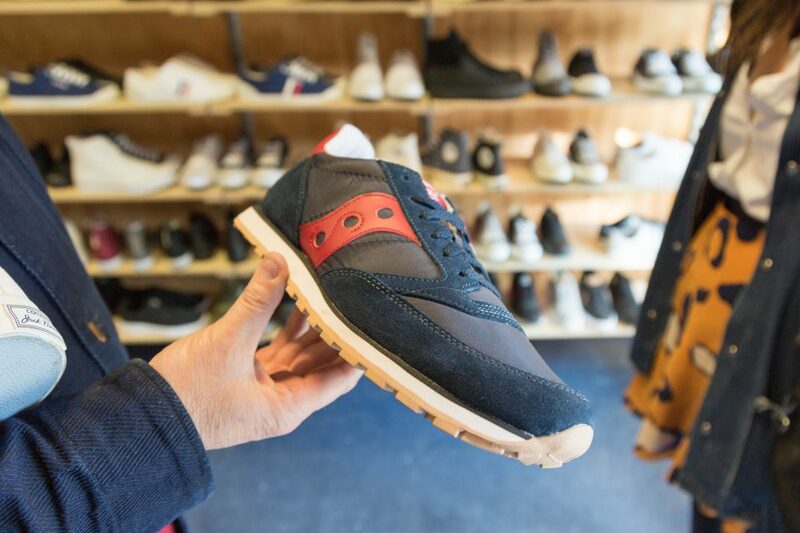 Saucony Jazz Lo Pro is another favourite of mine. Guys from all over town will come for these. It’s one of the dumbest sneakers ever developed by guys who used to run the Boston Marathon back in the late 70s. They were working for a sporting goods company that wasn’t even making shoes, but whenever they would run the marathon their feet would be full of blisters for weeks on end. I guess they put themselves together with a design crew and they came up with this very simple sneaker that’s almost like a soft, tennis ball feel on the inside. They named it the Saucony Jazz. We opened the store with a lot of Pro Keds. Pro Keds was the competition to Converse back in the 20s, 30s, 40s and 50s, and Keds had the first sneaker ever in 1916. They had the first shoe with a rubber bottom. Basketball players needed shoes with rubber bottoms so they came out with Pro Keds for the pros in the 20s and 30s and they’re still around, they’re classics. The white canvas is amazing. We’ve seen a lot of brands come and go but the classics stick. 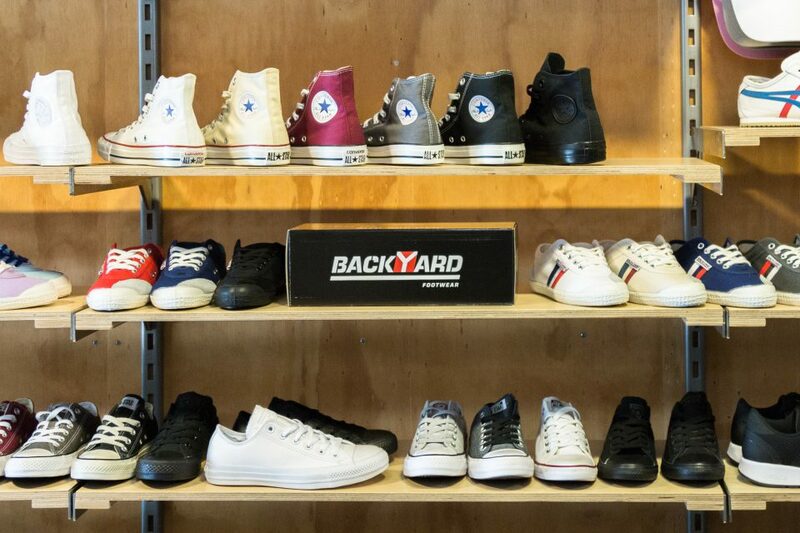 Backyard is a Danish brand founded in 1972, I think, in Copenhagen. It’s the local sneaker and I’ve known about this show for years. They’re actually called by another name in Denmark, they’re called Kawasaki but they can’t use Kawasaki here in North America. If this shoe doesn’t say retro and old-school, I don’t know what does. So anyway, they re-named them Backyard which is interesting, I guess. For anyone who wants to work at the shop, what do you look for in people? How do you build this family? Béatrice I met when she was thirteen. (Calls over to Béatrice) “How old are you now Béatrice?” “Twenty-one?” Her mom would come into the shop with her two daughters and buy shoes. I remember she was a very happy girl and always smiling. She came back looking for a job when she was seventeen. (Béatrice chimes in) “I was nineteen. Yeah, I was, like, old!” Oh okay, she was nineteen, whatever. I’ve always had a rule of thumb: If I know their mother, usually it’s a good sign. Béatrice we hired and knew as a neighbourhood girl. When I know the parents, I know they’re honest kids. Or students from the neighbourhood who know the neighbourhood so they can help direct people around… these are the types of people I hire. (Béatrice says) “Sam is awesome! Really nice guy who can be extremely generous.” Béatrice is a rocker, she plays a lot of Led Zeppelin in the shop! We hire a lot of French people too, from France. I guess they’re good kids who are willing to work! Jérémie has been with us for two years but he is leaving. He might come back if he gets Montréal-homesick. (Jérémie adds) “After two years there is a feeling like this shop is my shop. I love this neighbourhood. It’s moving all the time and you meet people all day. And Sam has become family because I don’t have family here. So for example, we go to his house for Greek Easter.” I like to make people eat. What do you like most about being on Parc Avenue? I grew up in Mile-End, it was a big hang. So Parc Avenue is very close to me. It’s the street we did everything on. We took it to go downtown as kids on the 80 bus, late night partying downtown, pick up bagels at three or four in the morning or a gyro or something. It was our hood. There was always a place to hang on Parc Avenue. back in the day whether it was a pool room or a bar. There are good memories. Why open a shop anywhere else? I like this neighbourhood. We drink coffee at Social Club ‘til one in the morning on the terrasse in the summer with buddies. Thinking about yourself back in 2009, could you offer your best advice to entrepreneurs who want to start something in Mile-End? Focus on a particular type of product or service. A niche. Don’t spread yourself thin. Offer one-on-one knowledge. The story or history behind the brand. You have to love meeting people to have a small shop in a neighbourhood like this. 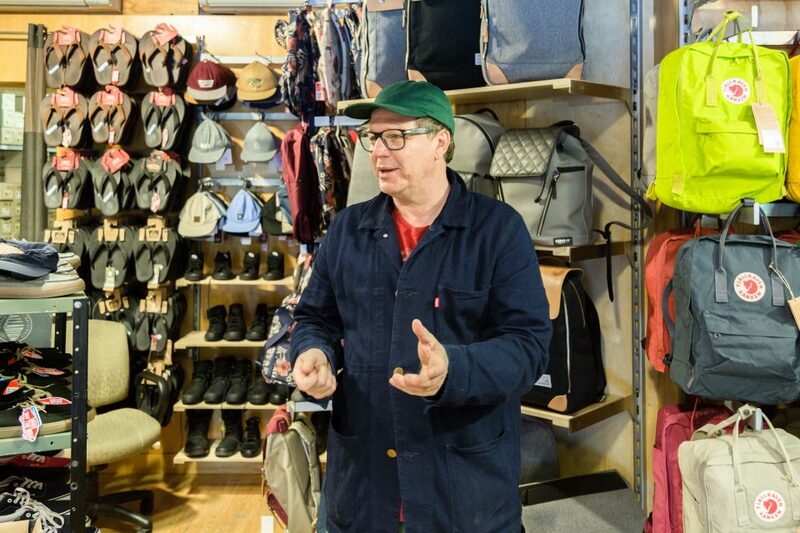 When you meet someone in a small boutique they’re part of your life, they’ll show you something interesting, maybe a product you’ve never seen. That’s what we pride ourselves on. Somebody walks in and we like to make them feel at home. And if they’re visiting the city we like to help them find something to remember Montréal. Whether it’s their first pair of Backyard from Denmark or whatever it is. We’re grateful to be alive because times have been tough. I wish the city of Montréal would reduce business taxes or put a freeze for new entrepreneurs here in the Mile-End. We have a lot of empty locations and you have six months to survive. Right now it’s a lot tougher. It’s a pity because there are a lot of young people who would love to have an opportunity and it’s not really within reach. Where do you usually stop on a walk around the neighbourhood? I always like to go to Latina for a sandwich, they make it on the spot and it’s always fresh. I love my bagels as you can see (points to belly). We have amazing places to eat. Taza Flores who has been here forever. Mythos across the street is a great Greek restaurant. The famous Milos. The best sandwiches in town are in this neighbourhood. Green Panther. A Portugese chicken sandwich at Serrano.